Do all canonisations need to be accepted as infallible? 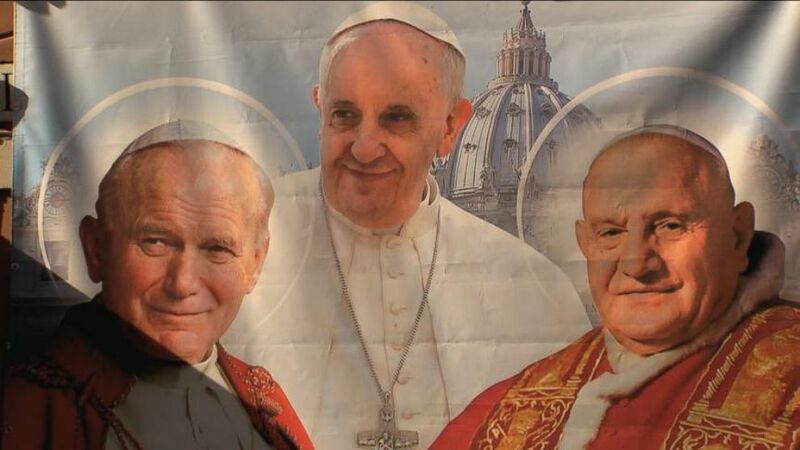 The canonisations of John XXIII and John Paul II, and the announcement of the pending canonisation of Paul VI, have raised some controversy among traditionalists. On the one hand, objections have been raised to the conduct of the process of these canonisations and to the claim that these pontiffs exhibited heroic virtue. On the other hand, there has been a tendency to hold that traditionalists should accept that all canonisations are infallible, because this is thought to be the traditional theological view. This latter tendency seems to have got the upper hand, with the result that Catholics have largely come to the conclusion that once someone is canonised, it is the duty of Catholics to accept their sanctity and to cease questioning their canonisation. This essay is intended to reject this conclusion, and to present an alternative view on the subject of the duty of Catholics with regard to canonisations. The view that is being advanced here needs to be carefully explained at the outset. It is not the claim that Catholics are free to accept or reject the truthfulness of canonisations that are officially promulgated by the Supreme Pontiff, as they please. Nor is it the view that canonisations are not authoritative, in the sense of deriving their claim to acceptance purely from the evidence that is presented for the sanctity of the person canonised, and not at all from the fact of the official promulgation itself. Such promulgations in themselves give rise to a duty of belief on the part of Catholics. Nor is it the view that the canonisations of John XXIII and John Paul II are erroneous, because these individuals are not now enjoying the beatific vision in heaven. The sanctity of these two pontiffs will not be addressed here. What is being advanced is the precise claim that not all canonisations need be accepted by Catholics as infallible acts of the magisterium of the Church. The initial point that needs to be made in this discussion is that the infallibility of canonisations is not taught by the magisterium of the Church. Belief in their infallibility is not therefore required of Catholics. This point is agreed on by theologians, as can be illustrated by the teaching of a standard manual of theology; van Noort, Castelot and Murphy's Dogmatic Theology vol. II: Christ's Church (Cork: Mercier Press, 1958). These authors follow the traditional and very important practice of attaching a theological note to every thesis that they advance. These notes specify the degree of authority possessed by each thesis, and the corresponding obligation to believe that is laid upon Catholics. The highest note is 'de fide': it belongs to propositions that must be believed with the assent of theological faith, and that cannot be knowingly and pertinaciously rejected without committing the sin of heresy. The lowest note is 'sententia communis', which, as Ludwig Ott states, means 'doctrine which in itself belongs to the field of free opinions, but which is accepted by theologians generally' (Ludwig Ott, Fundamentals of Catholic Dogma, 6th ed. (St. Louis, Mo. : Herder, 1964), p. 10). Van Noort, Castelot, and Murphy specify that the canonisations in question are the final and definitive decrees by which the supreme pontiff declares that someone has been admitted to heaven and is to be venerated by everyone. The decree of authority that they attribute to the claim that such canonisations are infallible is 'sententia communis', the common opinion of theologians (van Noort, Castelot and Murphy, p. 117). Their evaluation of the authority of this claim is the more significant because they themselves agree with the assertion that such canonisations are infallible. There can thus be no intention on their part of minimising the authority of a claim with which they disagree. The assertion that canonisations are infallible thus belongs to the field of free opinions. It is not one that Catholics have an obligation to accept. This has been denied by Fr. Benoit Storez SSPX, who has claimed that doubting the infallibility of canonisations is 'temerarious'. But to say that a proposition is temerarious is not the same as to say that it departs from the common opinion of theologians. The censure of temerity adds something to departure from the common opinion of theologians; it adds the assertion that this departure is undertaken without reason. But there do in fact exist serious reasons for questioning the infallibility of canonisations. The first category of reasons are those that have always been raised to the assertion of such infallibility, an assertion which has never been the subject of complete unanimity among theologians. One such reason is the existence of prayers in the canonisation ceremony for the truthfulness of the decree of canonisation, prayers which were plausibly thought to recognise the possibility of the decrees not being truthful. The second category of reasons arise from the more recent introduction of changes in the process of examining the cause of the persons canonised that considerably lessen the reliability of these examinations, such as the abolition of the office of devil's advocate and the reduction in the number of miracles demanded for canonisation. Fr. Storez is thus mistaken in asserting that questioning the infallibility of canonisations is temerarious. The fact that the Church has not taught that canonisations are infallible means that there is no sin in Catholics denying their infallibility for serious reasons, but it does not however imply that they are not infallible. After all, the Church did not teach the doctrine of papal infallibility until 1870, but the pope was infallible prior to 1870 nonetheless. What needs to be established for our purposes is that canonisations, in the sense of the final and definitive decrees by which the supreme pontiff declares that someone has been admitted to heaven and is to be venerated by everyone, are not in fact infallible acts of the supreme magisterium. There are two arguments that establish this conclusion. 1). The canonisation of saints by the Supreme Pontiff does not satisfy the criteria for an infallible definition as set out by the First Vatican Council. By the inspiration of the Holy Spirit, for the honor of the Holy and undivided Trinity, for the glory and adornment of the Virgin Mother of God, for the exaltation of the Catholic Faith, and for the furtherance of the Catholic religion, by the authority of Jesus Christ our Lord, of the Blessed Apostles Peter and Paul, and by our own: We declare, pronounce, and define that the doctrine which holds that the most Blessed Virgin Mary, in the first instance of her conception, by a singular grace and privilege granted by Almighty God, in view of the merits of Jesus Christ, the Savior of the human race, was preserved free from all stain of original sin, is a doctrine revealed by God and therefore to be believed firmly and constantly by all the faithful. Hence, if anyone shall dare -- which God forbid! -- to think otherwise than as has been defined by us, let him know and understand that he is condemned by his own judgment; that he has suffered shipwreck in the faith; that he has separated from the unity of the Church; and that, furthermore, by his own action he incurs the penalties established by law if he should are to express in words or writing or by any other outward means the errors he think in his heart. For the honour of the blessed Trinity, the exaltation of the Catholic faith and the increase of the Christian life, by the authority of our Lord Jesus Christ and of the holy Apostles Peter and Paul and our own, after due deliberation and frequent prayer for divine assistance, and having sought the counsel of many of our brother bishops, we declare and define blessed John XXII and John Paul II to be saints, and we enrol them among the saints, decreeing that they are to be venerated as such by the whole Church, in the name of the Father and of the Son and of the Holy Spirit. Benedict XVI added the following prayers to the canonisation ceremony: 'Most Holy Father, Holy Church, trusting in the Lord's promise to send upon her the Spirit of Truth, who in every age keeps the Supreme Magisterium free from error, most earnestly beseeches Your Holiness to enroll these, her elect, among the saints', spoken by the person presenting the saint to the pope; and 'Let us, then, invoke the Holy Spirit, the Giver of life, that he may enlighten our minds and that Christ the Lord may not permit his Church to err in a matter of such importance', spoken by the pope himself. Some authors have claimed that the formula of canonisation, or the formula of canonisation together with the prayers added to the ceremony by Benedict XVI, suffice to make canonisations an infallible papal act. In considering this claim we need first to keep in mind a basic principle that governs infallible definitions, which is that these definitions have a legal character that results from their strictly binding the minds and actions of the faithful. They are thus understood by all theologians as existing only when they are clearly stated and promulgated, according to the ordinary rules of language and communication; a doubtful law does not bind. There cannot be any reasonable doubt about the presence of the criteria for such a definition, if it is to be infallible. In the case of the formula of canonisation, however, the requirements for an infallible definition are not present. The formula invokes the authority of the supreme pontiff as vicar of Christ and successor of Peter, but this authority is not confined to the act of making an infallible definition. The crucial fact is that there is no mention of teaching a question of faith or morals, no requirement that the faithful believe or confess the statement being proclaimed, and no assertion that a denial of the proclamation is heretical, subject to anathema, or entails separation from the unity of the Church. The absence of these condemnations is itself an absence of the condition of the intent to bind the whole Church in the sense required for an infallible teaching, because these assertions are what constitute binding the Church in this sense. A binding is done in some particular way; there must be a bond, a constraint, that does the binding. The constraint that applies to infallible definitions is the state of heresy, anathema, and separation from the unity of the Church that is the result of not professing them. The presence of the word 'definimus' in the formula of canonisation does not alter this fact. For an infallible definition to occur, it does not suffice to say that a definition is being made; the conditions necessary for a definition must actually be carried out. Nor can we suppose that the use of the Latin word 'definimus' necessarily signifies the act of defining a doctrine of the faith. The word has a more general, juridical sense of ruling on some controversy concerning faith or morals. This general sense was recognised by the fathers of the First Vatican Council, and explicitly distinguished by them from the specific sense of 'definio' that obtains in infallible definitions. Nor do the prayers added by Benedict XVI make any difference to the non-infallible character of canonisations. The reference to the Holy Spirit's keeping the magisterium free from error in these prayers is not an assertion that the canonisation itself is an infallible act, and is not itself an authoritative declaration, since it is not spoken by the pope. The prayer actually spoken by the pope is not in any way an assertion or guarantee of infallibility. The pope's intending to do something that is not erroneous, and his doing something immune from error, are two different things. The prayers added by Benedict XVI ask God to prevent the decree of canonisation from being actually erroneous, not to make them infallible pronouncements. Such a request would be superfluous when the conditions necessary for an exercise of papal infallibility are actually present, and accordingly such prayers are not attached to infallible definitions; the prayers that on some occasions are stated as having preceded such definitions have to do with discerning the possibility and opportuneness of making an infallible definition, not with the infallibility of the definition itself. 2.) The act of canonisation need not fall within the bounds of the Church's infallibility. The Roman Pontiffs, according to the exigencies of times and circumstances, sometimes assembling Ecumenical Councils, or asking for the mind of the Church scattered throughout the world, sometimes by particular Synods, sometimes using other helps which Divine Providence supplied, defined as to be held those things which, with the help of God, they had recognized as conformable with the Sacred Scriptures and Apostolic Traditions. For the Holy Spirit was not promised to the successors of Peter that by His revelation they might make known new doctrine, but that by His assistance they might inviolably keep and faithfully expound the Revelation, the Deposit of Faith, delivered through the Apostles. And indeed, all the venerable Fathers have embraced, and the holy orthodox Doctors have venerated and followed, their Apostolic doctrine; knowing most fully that this See of holy Peter remains ever free from all blemish of error, according to the Divine promise that the Lord our Savior made to the Prince of His disciples: "But I have prayed for you, so that your faith may not fail, and so that you, once converted, may confirm your brothers." (Lk 22:32). The purpose of papal infallibility sets limits to the contents of infallible papal definitions. If a papal statement is not concerned with either a religious truth contained in divine revelation, or some matter that is 'so closely connected with the revealed deposit that revelation itself would be imperilled unless an absolutely certain decision could be made about them', then it cannot be an infallible definition. The upholders of the infallibility of canonisations however do not make any effort to explain how canonisations are connected to the revealed deposit of faith; it is as if they consider papal infallibility to be a prerogative of the papal office that is intended to put the pope above the danger of being discredited by error, rather than a gift made by God to protect the faith he has given to the Church. One might object that we are not entitled to decide ourselves whether a given papal teaching is concerned with matters of faith and morals; this is something that is for the pope himself to decide. This observation is correct, but it does not provide an objection to the argument that is being offered here. In the case of infallible papal definitions, we can be sure that the teachings concerned are essentially connected to divine revelation because the definitions themselves say so. This assertion is part of what constitutes an infallible definition, as we saw above. It is made in the definitions of both the Immaculate Conception and the Assumption, which incorporate the phrases 'is a doctrine revealed by God and therefore to be believed firmly and constantly by all the faithful', and 'we pronounce, declare, and define it to be a divinely revealed dogma'. It is precisely by including such statements in authoritative pronouncements that the pope decides and determines that the contents of these statements are divinely revealed or essentially connected to divine revelation. Such phrases are not present in the formula of canonisation, so this formula provides no basis for claiming that the pope holds that the assertions made by the use of this formula have any connection to divine revelation. Some argument must be offered if we are to accept that canonisations are related to divine revelation, despite the lack of any reference to such a relation in the rite of canonisation. Evidently the saintliness of individuals of the post-Apostolic era cannot be contained in or logically implied by divine revelation itself. So canonisations, if they are to be related to divine revelation, must be so in virtue of being proclamations of dogmatic facts. The classic example of such a dogmatic fact is the assertion that the five condemned Jansenist propositions are contained, according to the ordinary rules for the interpretation of language, in Jansen's work Augustinus. This fact obviously is not contained in divine revelation; it is because the condemned propositions themselves contradict divine revelation, and the book in question (contrary to the Jansenist claims) asserts these propositions, that the pope has the power to infallibly teach that the propositions are contained in that book. This power is necessary because the pope's charism of infallibility does not exist simply to proclaim the abstract truth about doctrine, but also to protect the faith of Catholics. If this charism did not extend to discerning and condemning particular concrete heretical statements such as those in Jansen's book, it would not suffice for the purpose of protecting their faith. It seems to be the case that there are some instances where a given person's being a saint is a dogmatic fact. That is why the argument that is made here is that canonisations do not as such fall within the scope of the charism of papal infallibility. The claim is that the factors that make a person's sanctity a dogmatic fact are not always present in canonisations, and hence that canonisations are not by themselves infallible definitions. Some other element is needed to constitute a person's sanctity as a dogmatic fact. This element can take one of two forms; the truth of a canonisation can be necessarily connected with the truth of the Church's infallible teaching on faith and morals, or it can be a necessary consequence of the fact that the Church is guided in general by the Holy Spirit. The former case will arise when the doctrine of a particular saint has been so extensively adopted by the infallible teaching of the Church that denial of his sanctity would cast doubt upon the teachings themselves. Examples would be the doctrines of St. Athanasius, St. Augustine and St. Cyril of Alexandria. These saints took leading roles in shaping the doctrines of the Church through their personal theological work. To reject their sanctity would thus be to cast doubt on the doctrines themselves. In such a case, therefore, the Church should be considered to be infallible in proclaiming their sanctity. The latter case will arise when devotion to a saint has been so widespread and important in the Church that the denial of that individual's sanctity would cast doubt upon the role of the Holy Spirit in guiding the Church. Take a hypothetical example that is deliberately extreme, in order to make this point clearly. Suppose a biblical scholar were to produce a document that allegedly established that St. Paul, during the persecution of Nero and after the composition of his epistles, promptly apostasised, betrayed the other Christians of the Roman Church, and ended his days as a pagan living on a state pension under a different name. Independently of any other objections that might be raised to this hypothesis, it would be incumbent upon Catholics to reject it simply because it is incompatible with the veneration of St. Paul that has been so widely embraced and encouraged by the Church. It would be impossible for the Holy Spirit to have permitted this extensive veneration if St. Paul had not in fact been a holy saint and martyr. These factors therefore can make it the case that a canonisation is an infallible action of the Church. But they are not often present in canonisations, so canonisations are not in themselves infallible acts. However, we should not end with this conclusion. The nature of those canonisations that are dogmatic facts enables us to deepen the discussion of the infallibility of canonisations, and to go beyond a simple rejection of the previous theological consensus about their infallibility. The discussion here has concerned the infallibility of papal decrees of canonisation taken in themselves. Its rejection of their infallibility has argued from the criteria that are applied to identify infallible definitions of faith and morals, criteria that bear upon the precise wording of supposed definitions when these are taken in the immediate context of the document in which they are issued. But this is not the only way to consider canonisations, and it is perhaps not the approach that was taken by Benedict XIV when he first advanced the thesis of the infallibility of canonisations in the 1730s. Rather than consider the papal decrees of canonisation taken in themselves, we can consider them in the context of the entire process that led up to them. When we consider this process as it was laid down by Benedict XIV and practiced for many centuries – with its rigorous scrutiny of the life of the candidate, its insistence on waiting for decades or centuries so that extraneous pressures and motivations can disappear and the fullest and most accurate historical evidence concerning the candidate can emerge, its far higher standard for miraculous intercessions by the candidate – we may well conclude that this process as a whole was infallible. We may well think that it is incompatible with the Holy Spirit's guidance of the Church for such a devoted, persevering, sincere, and thorough effort to arrive at the truth about an individual's sanctity to be allowed to fail. But this reason for believing in the infallibility of the former process of canonisation as a whole does not extend to the more recent decrees of canonisation that have deliberately abandoned this careful and honest search for the truth. It would indeed seem to be a piece of effrontery on the part of the Church to expect the Holy Spirit to make up for a disregard of honest and reasonable enquiry by a miraculous intervention to avert the consequences of such irresponsibility. This suggests criteria both for determining when a canonisation is not infallible, and for determining when the process of canonisation has actually failed and resulted in the veneration of someone who is not enjoying the Beatific Vision. A canonisation would seem to not be infallible when there are serious flaws in the process of canonisation itself. Such flaws mean that the Church has failed to take the steps necessary to enlist the aid of the Holy Spirit in preventing a mistaken canonisation. The lack of infallibility does not of course mean that the person canonised is not a saint. Padre Pio, for example, was canonised under the seriously flawed process of canonisation introduced by John Paul II in 1983, but that does not mean that he is not a saint or that he should not be venerated as such. A canonisation would seem to be actually erroneous when the balance of probabilities, given the full evidence about the process of canonisation and the life of the person canonised, is very strongly in favour of the process of canonisation having been seriously flawed, and also of the person canonised not having exhibited heroic virtue, but instead to have committed serious sins that were not expiated by some heroic penance. The judgment that a given canonisation is erroneous of course requires very substantial, thorough, objective and intelligent investigation, and no such judgments will be ventured in this article. We have therefore arrived at an even more narrowly defined conclusion than that suggested at the beginning of this paper. We need not hold that the canonisations of John XXIII and John Paul II were infallible, because the conditions needed for such infallibility were not present. 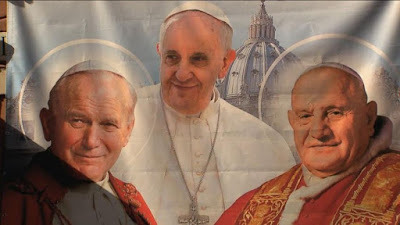 Their canonisations are not connected to any doctrine of the faith, they were not the result of a devotion that is central to the life of the Church, and they were not the product of careful and rigorous examination. But we need not exclude all canonisations whatsoever from the charism of infallibility; we can still argue that those canonisations that followed the rigorous procedure of former centuries benefited from this charism. Thus although the conclusion of our inquiry is narrower than anticipated, its lesson is broader. That lesson tells us that a return to the former approach to canonisation would mean recovering the guidance of the Holy Spirit in an area of great import for the Church. Romans 5:20 "But where sin increased, grace abounded all the more." FWIW, the parts emphasized were not, in my opinion, even the most important insights of this article, but I could not complete the emphases I had intended to note within the time allotted for editing. So more maligning of the Holy Catholic Church in order to defend the modernist heretics. Infallibility of canonizations is at least theologically certain, which, by your own standards, means that you've just committed a mortal sin in denying it. For the honour of the blessed Trinity, the exaltation of the Catholic faith and the increase of the Christian life, by the authority of our Lord Jesus Christ and of the holy Apostles Peter and Paul and our own, after due deliberation and frequent prayer for divine assistance, and having sought the counsel of many of our brother bishops, we declare and define blessed John XXII and John Paul II to be saints, and we enroll them among the saints, decreeing that they are to be venerated as such by the whole Church, in the name of the Father and of the Son and of the Holy Spirit. If this isn't infallible, then nothing is. You make a mockery of the Catholic Church. If a legitimate Pope "declares" and "defines" and "decrees that they are to be venerated as such by the whole Church", using such solemn language, mandating this for the Church, it cannot be anything but infallible ... meeting ALL THE NOTES OF INFALLIBILITY defined by Vatican I. The crucial fact is that there is no mention of teaching a question of faith or morals, no requirement that the faithful believe or confess the statement being proclaimed, and no assertion that a denial of the proclamation is heretical, subject to anathema, or entails separation from the unity of the Church. "no requirement that the faithful believe or confess the statement being proclaimed"
"no assertion that a denial of the proclamation is heretical, subject to anathema, or entails separation from the unity of the Church"
Since when did Vatican I declare it a requirement that something be declared explicitly subject to anathema? It simply taught that the matter has to be taught as something which "must be held by the whole Church". As for a matter of faith or morals, this term distinguishes the matter from natural truths (e.g. science or historical points not directly related to the Church). This analysis is preposterous and idiotic. In Quodlib. IX, a. 16, St. Thomas says: "Since the honour we pay the saints is in a certain sense a profession of faith, i.e., a belief in the glory of the Saints [quâ sanctorum gloriam credimus] we must piously believe that in this matter also the judgment of the Church is not liable to error." But I guess that the clown who wrote this article knows better. So SeanJohnson holds Feeneyites to be heretics because one or two theologians consider the matter of BoD to be de fide. So, by the judgment with which SeanJohnson himself judges, he is judged to be a heretic for denying the infallibility of canonizations. See the bolded passage. So either Feeneyites or not heretics or you are a heretic. You can't have it both ways, Johnson. Is the pope infallible in issuing a decree of canonization? Most theologians answer in the affirmative. It is the opinion of St. Antoninus, Melchior Cano, Suarez, Bellarmine, Bañez, Vasquez, and, among the canonists, of Gonzales Tellez, Fagnanus, Schmalzgrüber, Barbosa, Reiffenstül, Covarruvias (Variar. resol., I, x, no 13), Albitius (De Inconstantiâ in fide, xi, no 205), Petra (Comm. in Const. Apost., I, in notes to Const. I, Alex., III, no 17 sqq. 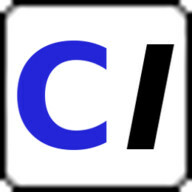 ), Joannes a S. Thomâ (on II-II, Q. I, disp. 9, a. 2), Silvester (Summa, s.v. Canonizatio), Del Bene (De Officio Inquisit. II, dub. 253), and many others. In Quodlib. IX, a. 16, St. Thomas says: "Since the honour we pay the saints is in a certain sense a profession of faith, i.e., a belief in the glory of the Saints [quâ sanctorum gloriam credimus] we must piously believe that in this matter also the judgment of the Church is not liable to error." These words of St. Thomas, as is evident from the authorities just cited, all favouring a positive infallibility, have been interpreted by his school in favour of papal infallibility in the matter of canonization, and this interpretation is supported by several other passages in the same Quodlibet. This infallibility, however according to the holy doctor, is only a point of pious belief. Theologians generally agree as to the fact of papal infallibility in this matter of canonization, but disagree as to the quality of certitude due to a papal decree in such matter. In the opinion of some it is of faith (Arriaga, De fide, disp. 9, p. 5, no 27); others hold that to refuse assent to such a judgment of the Holy See would be both impious and rash, as Francisco Suárez (De fide, disp. 5 p. 8, no ; many more (and this is the general view) hold such a pronouncement to be theologically certain, not being of Divine Faith as its purport has not been immediately revealed, nor of ecclesiastical Faith as having thus far not been defined by the Church. At the very least you are "impious and rash", in the opinion of many theologians committing a mortal sin ("theologically certain"), and in the opinion of some a heretic. The R&R's have been doing this since the "Canonization" of "Saint" JPII. They're gearing up again for the upcoming "canonization" of Paul VI by "Pope" Francis. Or to Fr. Ludwig Ott (who as the article points out, says the opposite of what you claim)? In any case, nobody has made any comments on the article, so not sure who you are talking to. This response shows that rather than reading the actual article (which refuted your comment), you instead read enough to get the gist of it, and went into defensive mode to protect sede-whateverism. Ah, and here we have it: The bile spilling from the overflowing cup. You know, Ladislaus, the one thing I can honestly say about you is that in all your proclamations and anathemas, I have never detected in you the least bit of piety or virtue. I think Mithrandylan hit it on the head, when it comes to you. At the end of the day, you are really just a loud-mouthed jackass, aren't you? Will we see fire and brimstone fall from heaven this year, or on the 70th anniversary of the abomination of desolation of the 1960ies robber council? Interesting that the formula of canonization was compared to the formula defining the Immaculate Conception. The definitions of the Immaculate Conception and the Assumption are the two papal acts outside of councils that even the liberal theologians accept as infallible. And they were highly formulaic even compared to other papal acts. Thus there are modern theologians who say these are the ONLY two infallible papal acts outside of councils. Is that where the author is headed? Yes, from the get go when I saw the posting, I thought the same thing. These articles always remind me of the end scene from the movie Casablanca, when Humphrey Bogart shoots the German general in front of Louie, the Vichy French police chief, and when the troop of cops shows up Louie says "the general has been shot, round up the usual suspects". "Paul VI is going to be declared a saint, round up the usual suspects to write articles"
If we do not have to believe with certainty of faith that JPII, JXXIII and the rest of the Vatican II "saints" are really saints, then we do not have to believe that all the saints before the strict process were saints. and in the end all saints become as nothing. Page created in 0.148 seconds with 33 queries.